The Gadsden Purchase (known as Venta de La Mesilla, or "Sale of La Mesilla", in Mexico) is a 29,670-square-mile (76,800 km2) region of present-day southern Arizona and southwestern New Mexico that was purchased by the United States in a treaty signed by President Franklin Pierce on June 24, 1853, and ratified by the U.S. Senate on April 25, 1854. The purchase was the last major territorial acquisition in the continental United States. It is named for James Gadsden, the American ambassador to Mexico at the time. The purchase included lands south of the Gila River and west of the Rio Grande. The Gadsden Purchase was for the purpose of the US's construction of a transcontinental railroad along a deep southern route. It was also related to reconciliation of outstanding border issues following the Treaty of Guadalupe-Hidalgo, which ended the Mexican-American War of 1846–48. 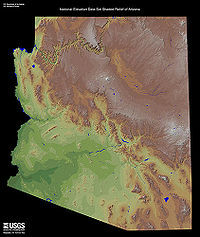 Shaded relief map of Arizona.